“The significance of this succinct introduction to the book Twenty Five Linocuts by Rani Chanda (then Dey) becomes even greater when the writer of this note is Rabindranath Tagore. “I AM glad to introduce to the public Miss Rani Dey, a student of the art department of Santiniketan. 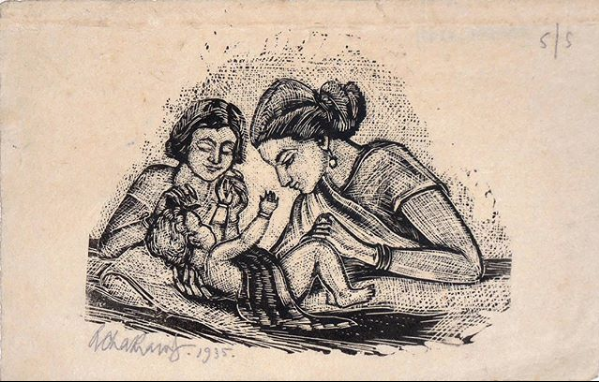 She has real artistic talent, as is evident in these lino prints done by her showing genuine feeling for her subjects and natural skill in execution.” The significance of this succinct introduction to the book Twenty Five Linocuts by Rani Chanda (then Dey) becomes even greater when the writer of this note is Rabindranath Tagore. 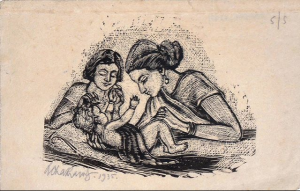 Tagore played an important role in introducing print in the dialogue of Indian art. Prints from Bengal: Modernism in Colonial India is an exhibition that will offer a glimpse of the print works of Chanda, Mukul Dey, Gaganendranath Tagore, Ramendranath Chakravorty and Ramkinkar Baij. The exhibition has travelled to Mumbai, after its first showing at Galerie 88 in Kolkata. “Over 30 years in the gallery, and being born and brought up in Kolkata, I know the importance of these print makers in Indian art. That’s why I wanted to show Mumbai what happened 100 years ago,” says Supriya Banerjee, director, Galerie 88. The artists lived through a period charged with the Swadeshi movement and colonial oppression. Their styles are differentiated by the region they worked out of in Bengal. Gaganendranath’s critical and humourous works will find resonance with today’s audience. But his style was very different from that of Baij, Chanda and Dey, who were inspired by the quieter environs of Santiniketan. This entry was posted in Project 88 and tagged Gaganendranath Tagore, Galerie 88, Mukul Dey, Prints from Bengal: modernism in colonial India, Project 88, Project 88 Mumbai, Ramendranath Chakravorty, Ramkinkar Baij, Rani Chanda. Bookmark the permalink.